View this blog post “What I Learned at 140 | The Twitter Conference (part 3)” on my new blog site at SmokeJumperStrategy.com/blog. Don’t Take the Drive to Manic Feature Explosion. This last point let to a rich discussion (debate?) as to the role that user feedback should play in defining a product roadmap and feature requests. This is something I’ve witnessed at many a product company – often times, companies and product teams can’t strike the right balance. This panel advised that user feature requests must be balaced with need for overall simplicity / usability. Here here! They all noted the struggle it is to prioritize a plethora of features and how to best utilize or focus their limited time. (But then again it is a nice problem to have if you are Twitter or even Tweetie that users care enough to request/demand alterations to your product – many/most start-ups would love to struggle with this dilemma). Lastly the panel suggested caution and “don’t take the manic drive to feature explosion.” Words to live by! I’m behind . . . more later. The Power of Presence. Insights from Alex Payne, Twitter API Lead. I am a Twitter God(ess) and So Can You! The View From Twitter Stardom with @ijustine, @missrogue and @davepeck. Don’t Take the Drive to Manic Feature Explosion. What Makes a Good Twitter App. Twitter business start-ups are combination socialist and radical markets. Twitter Strategies: Real-World Success Stories. WTF, No Twitter TV!? Direction from Anamitra Banerji, Twitter Product Management. Even with a simple hash tag, there is a learning curve. Soren MacBeth, Co-Founder / CEO of StockTwits. You can’t own social media. You can only interact with it. Corporate Use of Twitter by @JetBlue. Twitter will transform conferences & events. Surprising takeaways from an in-person Twitter conference experience. View this blog post “Election Prediction: Obama Wins (364)” on my new blog site at SmokeJumperStrategy.com/blog. As of 8:30am PDT, my prediction is that Barack Obama will win the election this evening to make U.S. Presidential history. I have been following the ups and downs of both candidates in the polls for months via Slate’s Poll Tracker ’08 application on my iPhone. Rather than looking at polls that calculate popularity of the candidates on a national level, Poll Tracker takes the latest poll in each state and makes a estimate of electoral college votes. This, in the end, is how the President is elected after all. Each state and their electoral college votes are placed into one of three categories: safe, lean and tossup. Obama has 273 electoral college votes that are considered “safe” and another 18 (Virginia and Nevada) that are “leaning” his way. This totals 291. Only 270 are needed to win. Conversely McCain has 129 “safe” votes and “12” lean (Arizona and South Dakota); giving him 142 votes. Obama will win handily. Let the voting begin and (all) votes be counted! View this blog post “Look Important With FakeCalls” on my new blog site at SmokeJumperStrategy.com/blog. I first traveled to Brazil some 13 years ago on a business study trip. At that time the Brazilian cellular industry was taking off. We observed a couple of the interesting dynamics that contrasted the Brazilian experience with that of North America. One was that people were bypassing landlines altogether, rather investing in a cellular phone as their only and exclusive phone number. Two, for people who couldn’t afford an actual cellular phone, they could purchase a “virtual” number which provided them a phone number and voice mail. The voice mail could be accessed via a pay phone and presumably any message could be returned via this manner as well. In effect, this represented a low-cost, virtual answering service. (I don’t expect this type of service exists much anymore). The most interesting service we learned about at this time was a service that would call you on your cell phone at a pre-arranged time. It was a way for Brazilians who could afford a cell phone back then to look important in front of friends, business colleagues and dates. Nothing like having to interrupt an in-person conversation to take a very important call. Of course there was no one on the other line. With the prevalence of cellular phones in much of the world today, the last thing most people need is their cell phone to ring in order to impress. (Often, it has the opposite effect). However there are times when you’d like to extract yourself from an awkward situation. 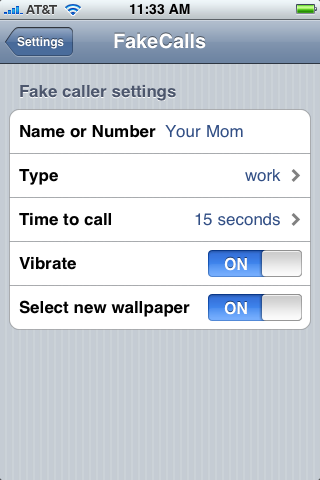 That’s were FakeCalls app for the iPhone comes in. It mimics the phone call receiving process on the iPhone. Load up the app, set the time you’d like to receive a call and after that amount of time passes . . . voila, your phone starts ringing and vibrating indicating an incoming call. See VentureBeat’s coverage of FakeCalls. Best way to get out of mind-numbing business meetings, family dinners or blind dates that have gone awry! View this blog post Escape to NYC and Wine 2.0 on SmokeJumper Strategy. Well after a long hiatus (and barely getting off the blog starting line in the first place), I’m back and more determined than ever to blog. So here goes my restart. I authored a guest post on the Savvy Sommelier, detailing some of the interesting tech companies in the wine vertical – showcase at Wine 2.0 event in NYC last month. 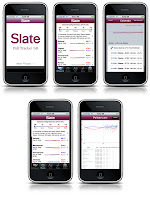 Check out my interactions with iPhone Application WineSnob, San Francisco-based custom winery CrushPad, wine price search engine Snooth and more . . .